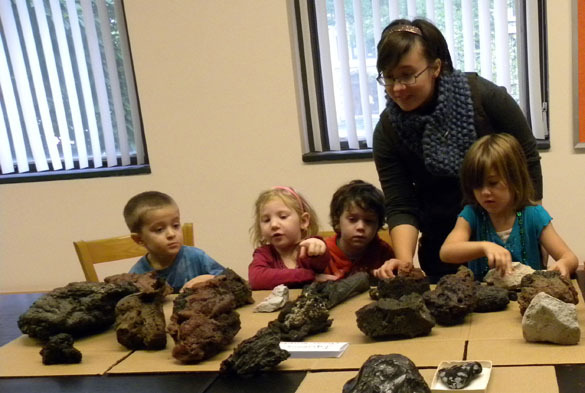 WOOSTER, OHIO–The Wooster Geologists have long had a special relationship with The College of Wooster Nursery School (where young children “actively construct their own knowledge of the world”). 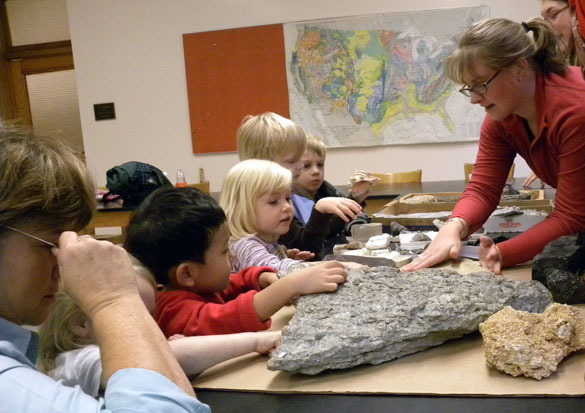 Every year our faculty and students talk to the children about rocks, fossils and dinosaurs. As you can imagine it is a most enjoyable — if a bit frantic — experience. For the past three years Professor Shelley Judge has been our primary faculty planner and organizer for these delightful events. Usually the kids walk up the hill from the nursery school about a block to Scovel Hall. There Shelley has exploration stations and, we hope, lots of college student volunteers to explain the materials. Today the topic was simply “rocks”, and the children came to see and hold a variety of igneous, sedimentary and metamorphic samples. Shelley set it all up and we had two sessions of about 18 kids each march in line up to the lab. They went through the specimens enthusiastically, feeling which are the smoothest and which the roughest, how heavy some are compared to others, seeing the world through a crystal of calcite, and marveling at ancient giant shark teeth. They each got to try on a hardhat, look through a handlens, and wear safety googles (which they find oddly fun). Then they line up and march back to the nursery school, clearly having enjoyed the experience. As did we! 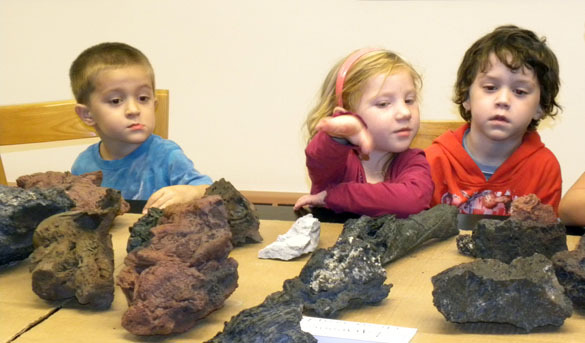 Kit Price ('13) showing some of our sedimentary rocks and fossils to the children. Katharine Schleich ('12) explaining some extrusive igneous rocks. 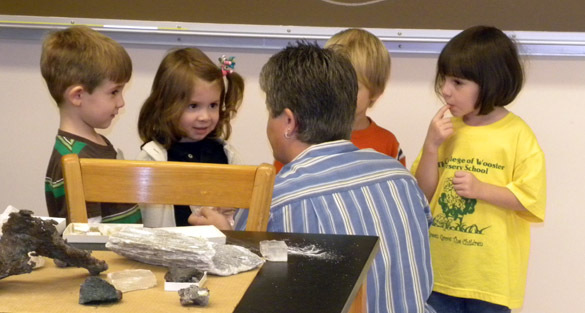 Shelley Judge talking to some of the children about minerals. Notice how intently they listen to her. She has the touch!